The UK Government has cancelled talks with senior politicians from Scotland and Wales over Brexit, MSPs have been told. Fiona Hyslop, the Scottish Government’s External Affairs Secretary, said a meeting of the Joint Ministerial Committee due to be held on Thursday will no longer take place. She said the move “flies in the face of the Prime Minister’s rhetoric” after Theresa May had promised an “enhanced role” for the devolved governments in Brexit negotiations. Mrs May told the Commons on Monday that while it was the job of her administration to “negotiate for the whole of the UK”, ministers were “committed to giving the devolved administrations an enhanced role in the next phase, respecting their competence and vital interest in these negotiations”. Scottish First Minister Nicola Sturgeon tweeted at the time she was “very sceptical” about the commitment. A UK Government spokesman confirmed Thursday’s meeting in Cardiff would not go ahead due to diary pressures on the part of Cabinet Office Minister David Lidington. He said: “We place the utmost importance on engaging with the devolved administrations ahead of the UK leaving the European Union and as you would expect, there are regular and detailed discussions at all levels. Bruce Crawford, convener of the Scottish Parliament’s Constitution Committee, questioned Ms Hyslop on “the best way forward of resolving the current impasse” over Brexit, after Mrs May’s proposed withdrawal deal was defeated by a record majority in the House of Commons. Ms Hyslop backed a second European referendum to try to achieve this – something the PM has ruled out. She criticised Mrs May for failing to consider seeking an extension to the Article 50 negotiation deadline, and for refusing to rule out a no deal Brexit. 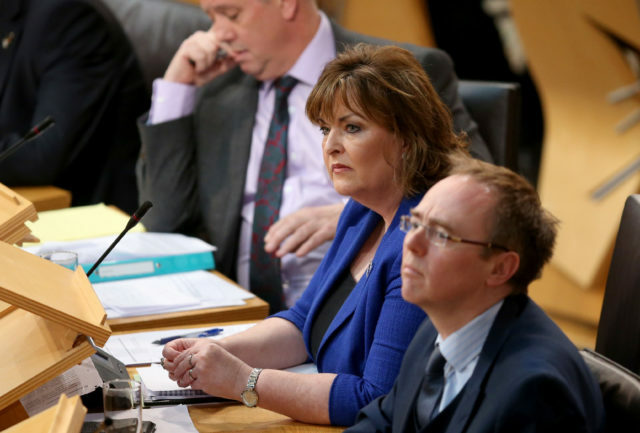 Ms Hyslop said: “The Scottish Government will continue to do everything we can to protect Scotland’s interests and the First Minister is due to meet the Prime Minister in the coming days.